So there I was at the glorious comic-book emporium Jim Hanley's Universe when I stumbled across Glamourpuss, "The high-fashion comic that's so six months ago," and even though the would-be fashion/women's mag satire is somewhat blunted by writer/artist Dave Sim's apparent lack of expertise in either area, the drawings are classic and fabulous. I may have to see if I can buy one. 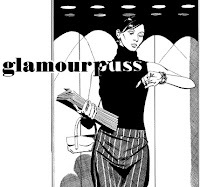 Glamourpuss #3 is due out soon. Get yourself one.